Better late than never as the saying goes. Last nights romp over the Isles, is the type of game, many of us have been waiting a season for. The team was firing on all cylinders. Read the recap here. No 3-D glasses required. Our boys in blue, started the game with a renewed energy, scoring 3 in the first and holding the fishies to a big fat Goose Egg! The shots were going in, the plays were smart, the defense had a pulse. I used to do something very similar in my elementary school days. I was brighter than a lot of kids in my class. As such, I would kind of get bored with the assigned exercises and start to doodle. Homework was also not a favorite of mine. The teachers would say "I was smart, but lazy..." Sound familiar anyone? Citywide tests, 98th percentile.. It turns out if I wasn't being challenged, I grew indifferent. Till I heard the magic words... "Summer School" and thought to myself.. well "oh shi... I better get crackin'"
Last nights effort is a prime example of what this team can do when it applies itself. 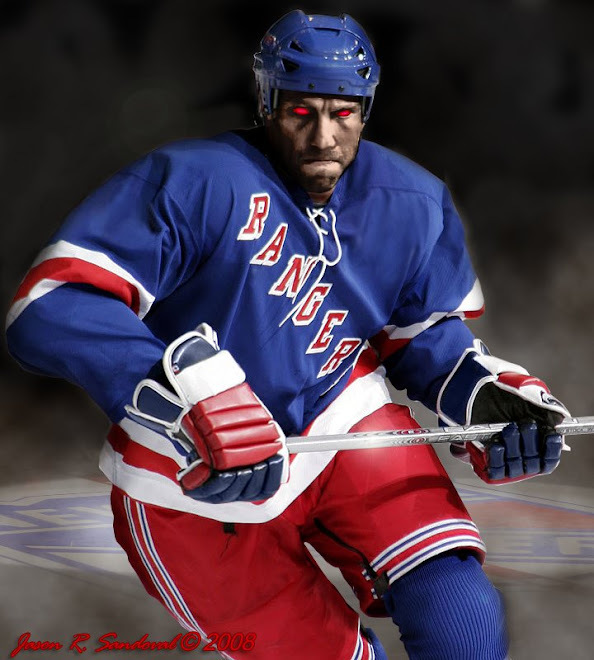 Granted... this was not Ovie, the Disabler and his Capitals nor Skidmark Sid and his sh*tbirds, we were playing against. It was team whose playoff hopes are as bleek as our own... maybe even worse. Dwayne Roloson did all he could last night but he was overwhelmed by our relentless attack which was largely based on long, up the middle outlet passes... and crashing the net to follow up. How many teams does that work on? A few... but not as many if we only do it a handful of times a season, or when we have nothing to lose, or we're hosting a lesser team (not that our home record is anything to brag about). Could it be that we're simply letting it all hang out last night because the pressure is really off and mentally many of our players and fans packed it in for the season... and it was novelty game in 3-D?Not a chance you say? ok. Trend wise it was almost an ideal game. -Defense was playing both sides of the puck. -Gabby was back to his scoring ways. -Our young guys played with fire and didn't look afraid. It didn't help that Gordon's fishticks were playing into all of it and taking penalties all over the ice. In fact if the teams switched jerseys, how likely would it be that we would be calling this a typical game by our underperforming blueshirts? 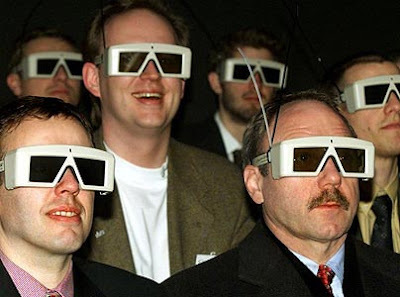 Word is the 3D glasses idea came to life after manage Ranger fans started complaining the rose color glasses they previously purchased, were defective. Nice post. So many 3-D jokes available but so few games remain. Interesting stat -- the defense registered 6 points -- 2 goals and 4 assists last night. That part of the offense has been missing for some time. 2 thoughts -- (a) Del Zotto has gotten a second wind and is playing more like he did at the beginning of the season and (b) the refs (for whatever reason) are swallowing the whistle against Avery and giving him the calls. Last night on one play, the refs whistled 2 Isles for 6 minutes of minors and a 10 minute misconduct while Sean got off scot-free (this was the power play in the 3rd). As a result, Sean has been able to resume his way of antagonizing opponents and his scoring also had picked up. Tonight's game against NJ is huge as the Blueshirts have to prove that they can keep the pedal pressed during the final 2 weeks. They have put themselves into a pickle but neither the Bruins nor the Flyers are ready to clinch yet. I say the whistle swing the other way tonight, Tony. Avery will get called for everything. Marty? Kovi?.. Whining at it's best. Floppers UNITE!!! Even our boys weren't playing on both sides of the puck last night in that first period especially. There is momentum pushing them forward but last night demonstrated no different a team except for a couple of pucks that actually went in this time around. Sadly, our hopes are up.